A tripod may not seem like the most high-tech photo accessory when compared to the fancy lenses, flash systems, and other electronic gizmos that you can add to your camera bag. But no matter how much you’ve spent on gear, it’s often a tripod that can make the difference between a successful shot and a blurry useless smear. If you’re gadget-happy, don’t worry—the modern high-end tripod is still a marvel of high-tech materials and engineering technology. What a tripod gives you, of course, is stability. And that stability buys you a few different things: you can use longer shutter speeds, which let you work in lower light; you can use smaller apertures with longer shutter speeds, which let you shoot with deeper depth of field in bright light; and tripods are essential if you need to repeatedly shoot the same scene, say for a time-lapse sequence or HDR. With modern digital sensors, you can work with less light than you could have shooting with film, but a tripod is still required to get sharp shots. All-in-one or à la carte? You can buy a tripod that’s a single, complete package with legs and a head, or you can buy a set of legs and a head separately. All-in-ones are typically less expensive, but buying individual components gives you more flexibility. You can choose both a tripod and head that precisely fit your needs, or upgrade one or the other (or both) as you see fit. With separate components, you can buy a head that you like, and multiple tripods for different occasions. For example, I have a separate, very light tripod for backpacking, and a sturdier, taller tripod that I use for studio shooting. At the top of the tripod is a head, which contains a mount for your camera and controls for moving the camera around. In general, these heads fall into two categories: Pan/tilt and ball head. Pan/tilt heads are what you typically use when shooting video, because they provide the ability to lock each axis (tilt, pan, and roll) independently. 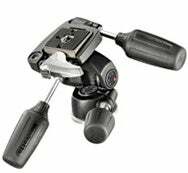 This allows you to unlock the pan axis and make smooth pans without worrying about accidentally moving the camera on one of the other axes. For still shooting, independent axis control is usually not needed, which is why a ball head often makes more sense. A ball head is simply a ball and socket joint. Loosen the head and you can move the camera in any direction. Moving it smoothly on one axis won’t be easy, but at least you’ll only have one control to deal with. 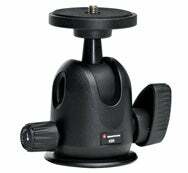 Ball heads are usually lighter and smaller than a pan/tilt head, and they offer simpler controls. Because they are a simple mechanism, ball heads are frequently more stable than a pan/tilt head. If you’ve ever experienced carefully positioning a camera, only to lock down the head and feel the camera drift a bit, then you’ll probably want a ball head. They’re far less likely to exhibit these kind of stability issues than pan/tilt head, especially at the low end. Ball heads have a durability advantage, as well—because they can be made using extremely simple designs, they’re resistant to dust, dirt, and wear, and they have fewer small components to break. Most quality heads provide a removable plate that you can leave attached to your camera. These plates provide a quick-release mechanism that makes it easy to quickly get your camera on and off of your tripod. No matter what type of head you choose, you’ll want to consider its weight and portability when shopping. Are you going to be carrying your tripod around, or will it be used in a studio or at home? If it's destined for travel, will you mostly transport it by car, or will you have to lug it around on your back? Balancing features with size and weight will be one of your main concerns when choosing a tripod. Fancier materials such as carbon fiber or magnesium alloys can greatly reduce weight, but you’ll have to pay more for them. The height of the tripod is also a tricky variable. Ideally, you don’t want to stoop to use your tripod, so if you can get one that raises all the way to your eye level, you’ll be more comfortable when shooting. However, a taller tripod won’t collapse to as small a size. If easy portage is a concern, then you may need to balance overall height with collapsed size. Compact tripods can have more leg segments, which take a little longer to set up. Tabletop and mini tripods are small, light, and portable, but don't have extendable legs (though some have optional extender pieces). These tripods are good for macro photography and for taking on trips when you have limited space. They are also ideal for point-and-shoot cameras, though a few are rated for heavier DSLRS. Carrying capacity is another element that you balance in to your buying decision. Every tripod and head has a certain weight limit that it can support, so check the load capacity in the specs ahead of time. Then consider the heaviest thing you might want to put on the tripod, which is usually your biggest SLR with its biggest lens, which can easily weigh in over 8-pounds. There's no need to whip out a scale—the camera and lens manuals will give weights and you can add them together. You may be tempted to round-up and get a tripod and head that hold far more weight than you need so that you have room to grow. 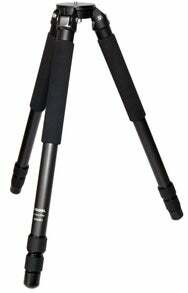 However, bear in mind that a tripod that can hold more is also a physically larger and heavier tripod. If you’re hard on your gear or plan on traveling through rough conditions, you'll want a more durable tripod. In addition to weighing less, carbon fiber tripods are also hardier than tripods made from other materials. I once accidentally ran over my tripod with a car in the middle of the Mojave (long story) and was very glad that I had a carbon fiber tripod with a ball head that was carved from a solid block of aluminum. Though scratched up, the tripod still works fine. What kind of clamps do the legs have? The extendable legs of a tripod have some kind of clamp for securing each segment of each leg. Some tripods use a twist clamp, others use a flipping lever. You’ll want to play with these to figure out which you like better. I prefer levers because I can deploy the tripod much faster than I can with twist clamps. What kind of set up time will you typically have? Do you want a center column? Some tripods have an additional column that rises out of the center to provide more height. While this can be a convenient way to get a taller tripod, bear in mind that when you raise the center column, you’re effectively using a monopod. So, if you plan to shoot in extremely windy conditions, then the center column may not be of any use. Does the center column have a weight hook? Some center columns have a hook that allows you to hang your camera bag, or a sandbag, from the bottom of the column to gain more stability. The hook also can be purchased separately and attached to an existing center column. Do you want to shoot straight down? Some tripods allow you to remove the center column and insert it into the head so that it’s parallel to the ground, or to place the center column in the head upside down. Both of these options allow you to shoot straight down. These positions can be very handy for product shots. What thread size does the tripod use? If your tripod head doesn’t use the same size screw as the top of your tripod, you might need to get a small shim to serve as an adapter. Most good camera stores will have these. As with any gear choice, balancing all of these options can be tricky, and cost can create a further constraint. But, this might be another reason to buy a separate tripod and head. Being able to swap out these components as you learn more, can make it easier to adapt as your needs change.